Honors College or Honors Program: What’s the Difference? As a high school senior, it can be tough choosing between a small college and a large university, and knowing which school can be the right fit. For those who have never been away from home, a small school with more interaction between the student body and the teaching staff might provide a more nurturing environment. Even some students looking for all the “BIG” things that come with a large school: sports teams, Greek life, lots of activity, and other students may also want a nurturing atmosphere within the larger campus. For those who do want both, honors colleges and honors programs can be the best of both worlds. A huge advantage to attending these programs is financial: At many of these schools you get the low tuition of a public university, but the perks of going to a smaller liberal arts college or a selective private institution. Ultimately, an honors program can be the perfect solution for a high-achieving student who wants to keep pushing themselves in college, but may not have the resources to attend a private institution. And while these programs might be something of a “bargain,” you can rest assured that they’re valuable opportunities and the quality of the education they offer is top-notch. Honors Colleges (which are essentially a college within a larger university) boast of smaller class sizes, access to more seminar-style classes, closer student-professor relations, and the opportunity to opt into extensive academic rigor, such as submitting a thesis during your graduation year. Some schools even offer honors students priority registration, the opportunity to be part of a special honors community, and additional scholarship money. Honors Programs usually have the same perks as an honors college, except that honors programs aren’t part of a particular college: These are programs that you fulfill as you get your degree at another of the university’s colleges. Further, while it’s tricky to put forward an average completion rate for honors programs and colleges, it seems to hover between 83% and 91%. (Keep in mind that this number is different from the university’s graduation rate.) Overall, an honors program sounds like a pretty sweet deal, right? Not so fast. As with all things in life, there are both pros and cons for every situation. Some of the cons of joining an honors college or program include having to maintain a higher college GPA than other students, dealing with the stress and expectations of a more demanding program, still having to take large lecture courses, and maybe facing resentment from the student body at large for having access to more resources, more scholarships, and better facilities. While it’s ultimately up to you to weigh the pros against the cons and decide whether an honors college or program is worth it, being part of an honors college can be something that ultimately enhances your college years. In addition, graduating from an honors college or program can enhance your post-college experience. You might want to graduate with honors to give your application a boost when applying to grad school, to get a leg up on research while you’re still an undergrad, or to show employers that you’re not the type to shy away from a challenge. You might not know exactly how this experience might relate to your future (you still have time to decide), but being an honors graduate might open even more doors of opportunity as you figure things out. Penn State’s honor college, Schreyer, has existed for around 60 years. Their program touts “academic enrichment including honors courses, exclusive study abroad programs, and research placements” as well as being part of the 5% of Penn State students who will graduate with honors. Students must maintain a 3.4 GPA, take at least two honors classes a semester (you must have 35 honors credits by the time graduation rolls around), and submit a thesis a month before they graduation college. 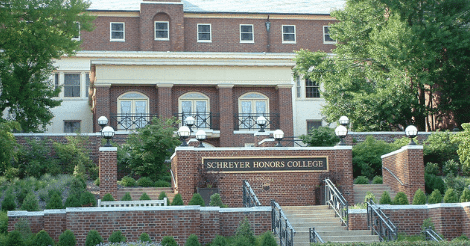 Schreyer also offers $5,000 annual and renewable scholarships to all incoming honors freshmen, as well as additional funds for experiences like study abroad and research. Purdue University’s Honors College offers benefits such as living in honors college housing, receiving priority registration for classes, completing a senior year research, thesis or scholarly project, and having a personal academic honors college advisor, as well as the opportunity to compete for honors college specific scholarships and fellowships. The University of Illinois at Chicago Honors College places an emphasis on the first-year experience. In addition to having to honors housing and exclusive scholarship opportunities, first-year honors students can apply to the Guaranteed Professional Program Admissions, which grants first years guaranteed admission to professional programs including medicine, law, dentistry, engineering, and more. In order to stay in the honors college, students must maintain a 3.4 GPA average. The program requirements are a little more complex than just taking one or two honors classes per semester, but the college offers a worksheet to help students stay on track. Michigan State’s Honors Program boasts of a successful honors program that sees 97% of honors college alumni working, in grad school or both. As part of the honors program, students can fulfill degree requirements in non-standard ways, which means that intellectual curiosity will be rewarded. The college also offers perks similar to others: small class sizes with a focus on interactive seminars, advising from both major and honors college faculty, priority registration after the first year, and individual research opportunities. In order to complete the program, students must complete eight honors “experiences” throughout their academic career. Students are admitted to the program by invitation only. As you can see from these examples, honors colleges ask much from you as a student, but you’re setting yourself up to get a lot in return. Going to college is all about growing as a person, whether that’s academically or otherwise, and honors colleges offer a huge opportunity to grow intellectually, socially, and generally as a person. It’s true that there’s no one-size-fits-all college, and there isn’t one honors program that’s perfect for everyone. Think about what you want out of your overall college experience. Take a look at the honors programs and colleges at the schools that you’re considering while you’re applying to college, as some only allow admission from incoming college students. Be aware of deadlines as well, because some honors colleges close admissions sooner than the overall university. If you’re not sure whether these programs are for you at this time, keep in mind that many programs offer continuing and transfer students a chance to apply or be invited. So, consider that those students who are no longer first-year students can still get in on the game. Just as you should stay on top of things now as you plan your potential honors college experience, you should also look to the future. How do you see yourself leveraging this experience for future opportunities? By Arlena McClenton, a senior at Barnard College studying comparative literature and web development. In her free time, she can be found drinking tea, scoping out the best campus study spaces, and exploring the city. Newer PostWhat is the Western Undergraduate Exchange?